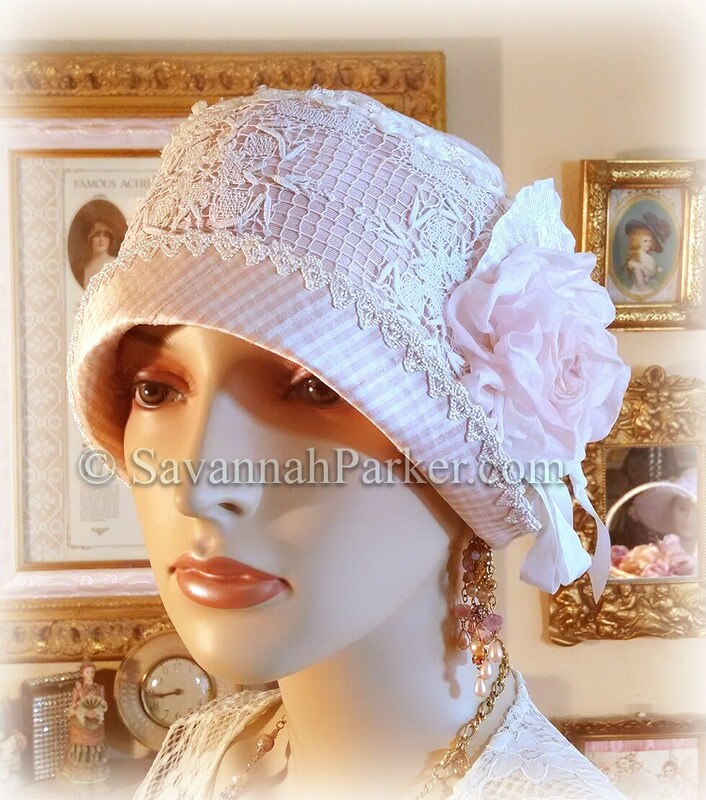 Vintage Style delightful pink and white silk summery 1920s Flapper Cloche Hat---this cloche hat features crisp pink and white tiny-checked silk, a gorgeous intricate handmade antique lace band and a large handmade pink silk flower..... Like all of my cloche hats, this one is exquisitely hand made from authentic 1920's patterns, absolutely sumptuous pure silk materials and lavish antique trimmings....yet so wearable today....this one is a light weight, perfect-for-spring & summer events and weddings style--it is ONE OF A KIND and is a SMALL size, please check the measurements before purchasing as there are no returns! 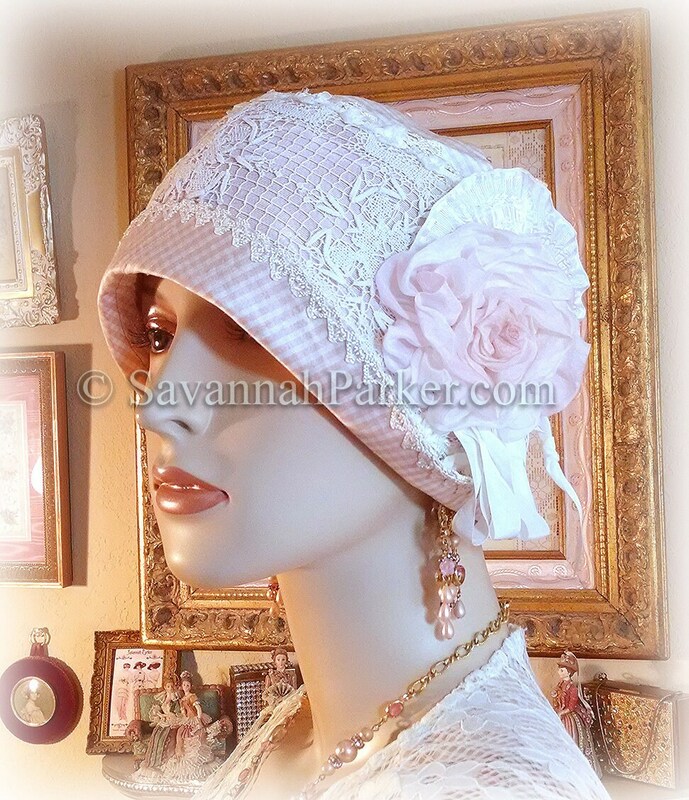 Just a perfect Great Gatsby/Downton Abbey event, spring/summer tea or Art Deco party or wedding cloche hat.....and, this hat is especially wonderful for the chemo patient as it fits closely to the head and looks soooo feminine and glamorous....everyone will ask "WHERE did you get that hat, it's so gorgeous!" READY TO SHIP. 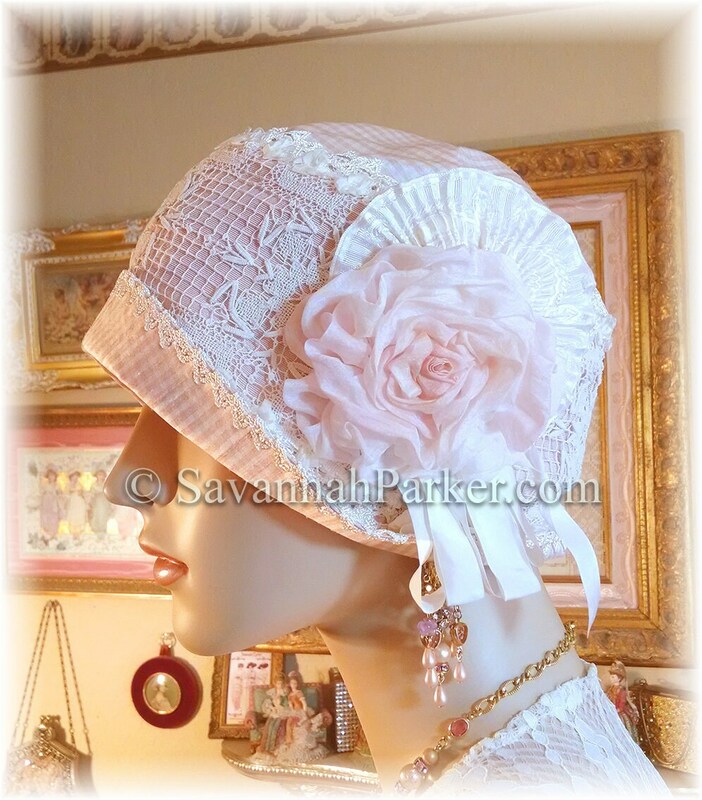 This exquisite little beauty of a cloche, which is one of my most popular styles, is made of lightweight pink and white checked silk taffeta....this is augmented with a fabulous wide band of the most intricate & exquisite white antique lace from the 20's. 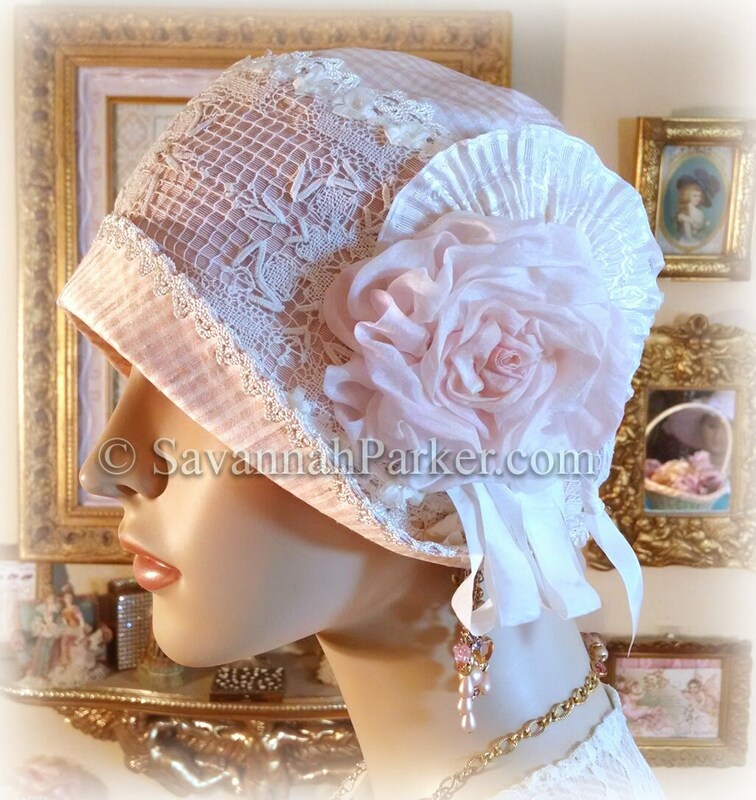 backed by solid light pink silk. This gorgeous band is bordered at top and bottom by delicate white rococo ribbonwork garland trim and handmade vintage white crochet lace....so exquisite! 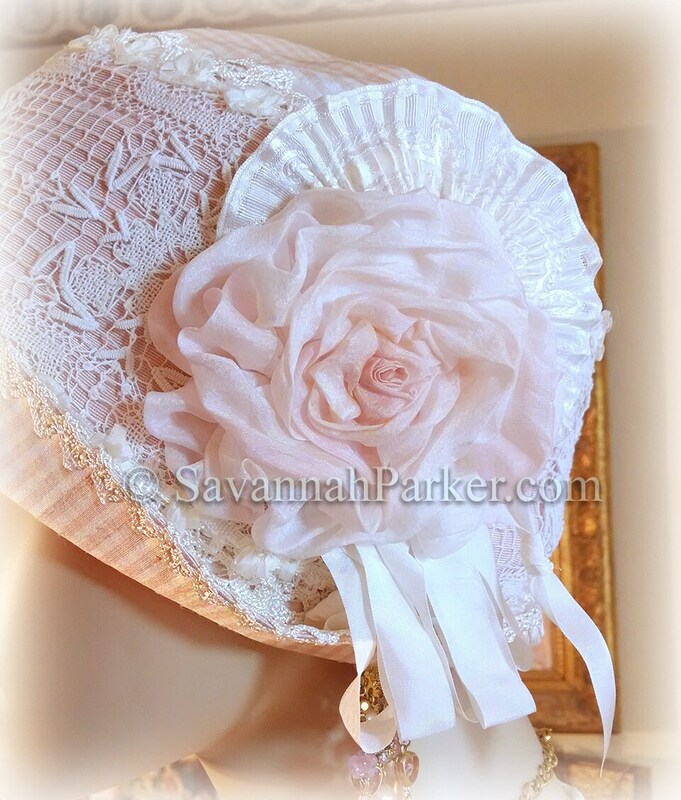 At the side is a delicate fan of pleated white antique silk jacquard ribbon behind a big handmade, hand tinted, "shabby chic" soft pink silk chiffon flower with a white silk multi-looped ribbon bow accent..... 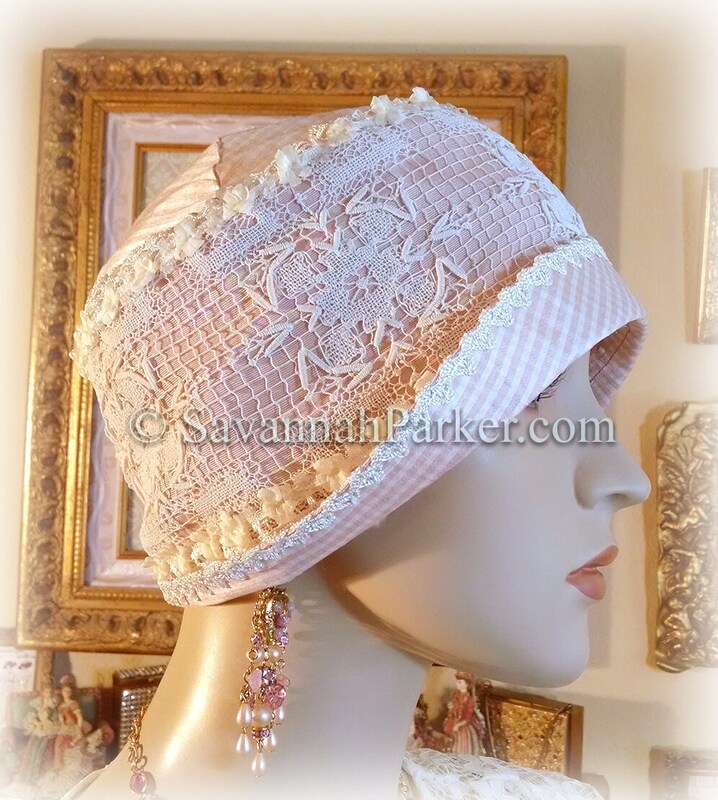 The brim edge is bound with more of the handsewn vintage white crochet lace..... just utterly beautiful details that take one's breath away. 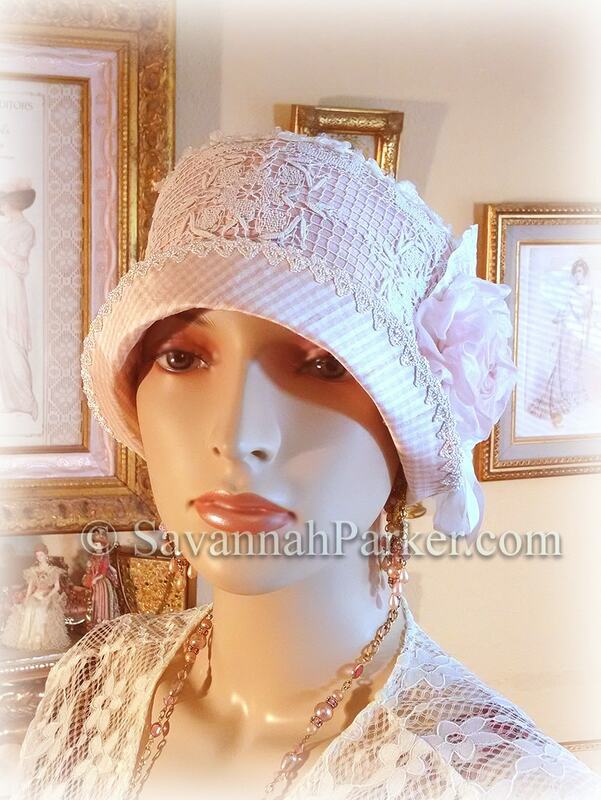 The fabric is just shimmeringly exquisite, the delicate accents make this piece look extraordinarily vintage and ALL of the exterior decoration including the individual decorative elements, are painstakingly sewn on by hand, just as in the "old days".....I'm a stickler for primo "old school" workmanship! 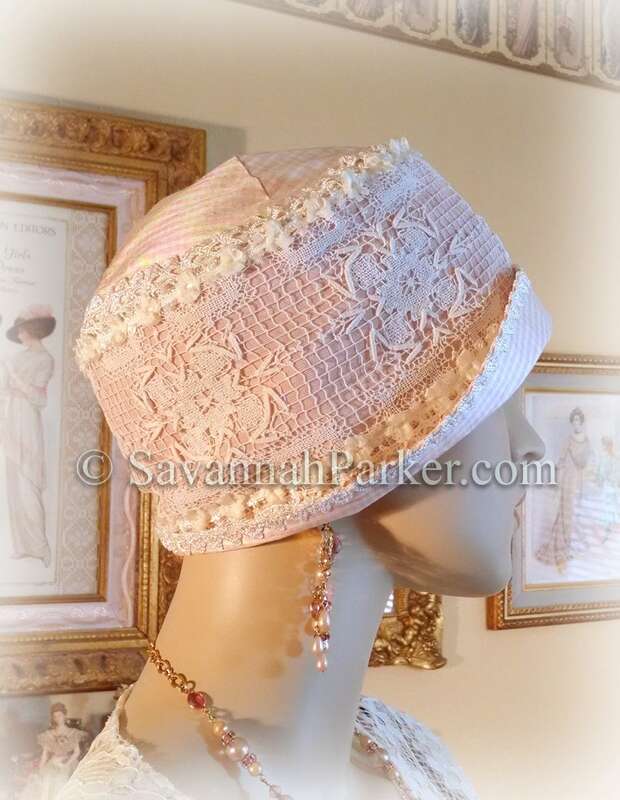 Fully lined in finest silk as well.....This would be just darling with a white lace/batiste sheer 20's summer dress So perfect for someone who has undergone chemo too, as this is a very comfortable hat....I think everyone has the right to be BEAUTIFUL and this would be a great gift for someone who needs that little lift and to feel so pretty....! 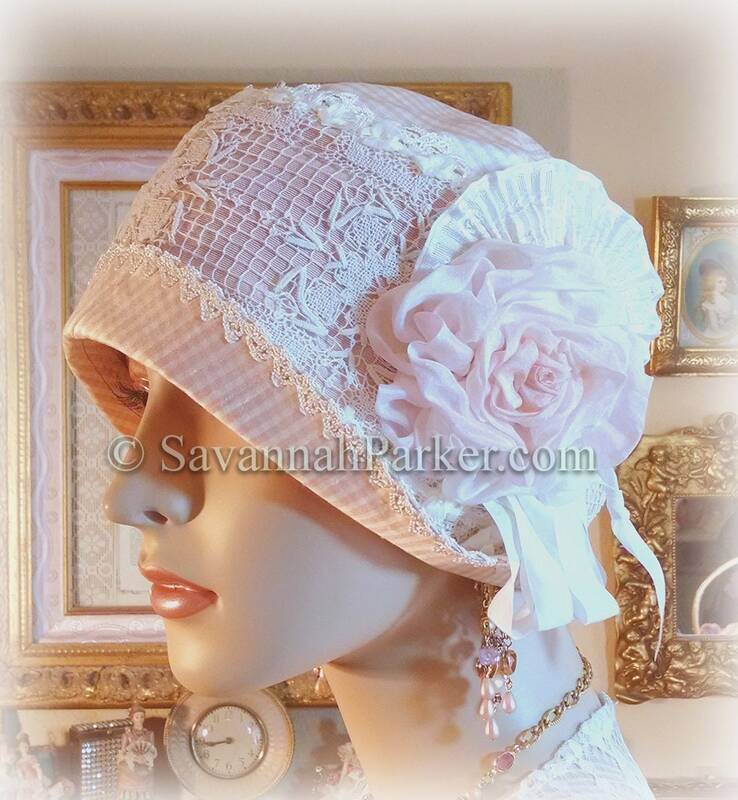 Also a great piece for anyone to wear to a vintage themed event or reenactment...this is as authentic and historically correct as it gets :-) Looks fabulous with the brim worn up or down, though I think it's best up. All hat shipping is BOXED and trackable USPS Mail including overseas; and there are no returns or exchanges on headwear! 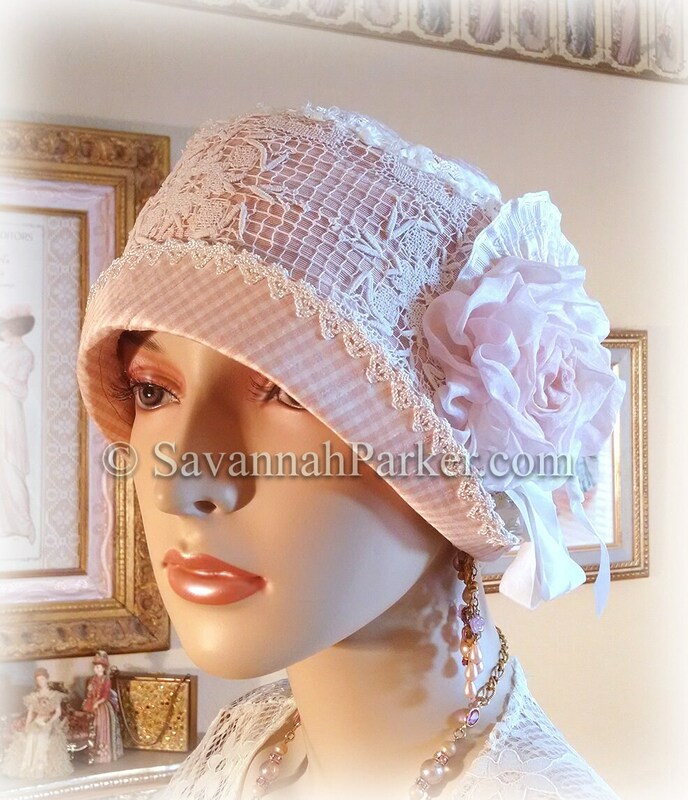 Please check my other listings for more hats, accessories & fabulous jewelry, as well as gorgeous hand embroidered decor pieces---I try to list new items at least bi-weekly....always a great selection of handmade vintage and antique inspired beauties. Thanks for visiting!